With Olympic fever raging (and sadly some of it really is sick this time around), I’ve been reflecting on the Olympic sports that I (and many parents) engage in every day. I practice these enough to be a world-class athlete by this point, and if I could find a sponsor to pay me for these activities, I’d be golden! 1. 500 meter Kindergarten Dash – It doesn’t matter how early I get up, we are ALWAYS late! I could have lunch made, everyone fed, backpack sitting at the door and inevitably something happens to delay us. The baby will blow out her diaper, I’ll lose my keys, something. And on the very rare chance that we’re all loaded in the car and leaving on time or – heaven forbid – early, we’ll discover major construction, an accident backing up our route or not enough gas to even make it 2 blocks. I think in the 5 months that my daughter has been in Kindergarten, we have literally made it on time maybe 5 times. I have noticed, however, that her teacher does attendance later and later, I think in an effort to save me from having to do the walk of shame with the baby in her car seat up to the office to sign in. Bless Her. 2. Lightweight Diaper Wrestling – My 10 month old hates getting her diaper changed (and getting dressed for that matter). When we have a particularly dirty diaper situation, I often find myself pinning her torso with my forehead or one arm/leg while I wipe and change as fast as humanely possible to avoid the spread of the mess! 3. Nighttime Living Room Slalom – I am so NOT one of those moms who, once their kids go to bed, spends time cleaning up the house. I am either working, blogging, indulging in one of my favourite things, or trying to catch some sleep before the baby wakes up! This means that the trip across the house between my bedroom and hers involves some significant skill to avoid the piles of clothes, toys and various baby gear. Unfortunately none of these things are as soft as snow. Ouch! 4. Synchronized Bath Swimming – My girls love being in the bath together, and when our youngest was very young, an adult would join in the fun too. We have a fair-sized sunken bath, but it still takes some synchronization to get us all in and clean and out in one piece! 5. Weight Lifting – I was spoiled with my firstborn being on the smaller side of the scale. At 5 years old she is still only 35 lbs, however my second is more than making up for her big sister. At 10 months old she is already 20 lbs and gaining every day. They often want me to hold both of them at the same time and I’ve got the pipes to prove it. It’s an added workout when I am carting the baby around in her car seat, which I often find myself doing during the 500 meter Kindergarten Dash! 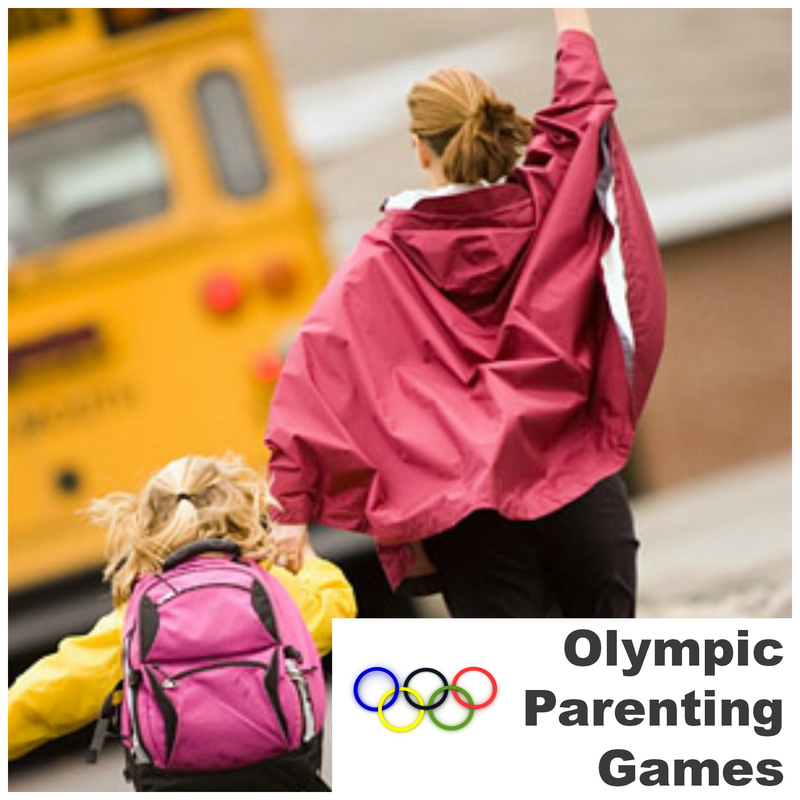 What Olympic Sports do you and your family participate in? Oh, how I hear you on #1! There are a couple of mornings a week where everything is in perfect order and I think, “Today is the day I will make it on time!” And yet, somehow, through mechanisms I don’t understand, I look at the car clock while pulling out of the driveway and see I’m 10 minutes late leaving. As always. “Naked Kid Chase” is the newest event here. My guy’s started eschewing his clothing and turning that into race time, which works great with me being seven months pregnant. Ooooh, yeah.